– In a cast iron skillet, heat butter, sauté shallots, & blueberries. – Cook over medium heat until shallots soften. – Add whiskey, keeping face at a safe distance in case pan flashes. – Stir in grape juice, lemon juice, & Honey-Dijon sauce. – Dilute cornstarch with water & stir into sauce; cook until thickened & set aside. 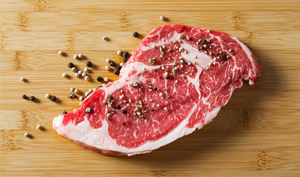 – Broil (or grill 7 minutes per side for medium rare) steaks to the desired doneness and serve with whiskey sauce.